This is the story of a mother who went in search of a nice little sling. One that would help a poor broken little arm. She set out one afternoon and visited all the pharmacies close to home. But one after another, they turned her away: no small slings in stock. The search was fruitless. But then at the last one a kindly assistant had a suggestion. Have you considered a fabric shop, dear? They have things called remnants she explained. Maybe you could cut a large triangle? There was a bright flash, as the red-faced mother had a light bulb moment. Er, thank you, she said exiting quickly. She went home and surveyed the cupboard. Then the shelves, the boxes, the floor, a table and some chairs. The accumulation was expansive; some might even say impressive. It was a clear case of not being able to see the sling for all the fabric. How embarrassing. Oh No - Argy or Bargy??? My mum still has her arm in a sling so I made her a new one using the old one as a template. I had to use black cotton drill so it wasn't exciting enough to blog about... now if she had let me make one in pink floral then things would be different! The pippijoe kiddie fabrics would make lovely 'OOAK' slings. Get better soon, little 'un! ditto with the ohnoes! Whoever is broke, I hope they feel ok and that it's soon on the mend - and not too itchy!? Yes, indeed cool slings. But not too cool. You don't want tiddlypeeps WANTING one! Poor little arm! But it's sure to be a very decorative and stylish arm. Hope the owner and his mother are bearing up! Can't wait to see which fabric you chose to pimp the broken arm. OH DEAR! I hope the bearer of the broken arm is OK.... And in this weather too - hot and itchy! :( Well, at least he'll have the coolest sling in history. Poor little mite with the arm. This could be a whole new market you are on the verge of you realise!!!!!! Trendy little slings, I can see them in all good chemists now. Oh! A little broken arm - that is NO FUN! But at least they will have the best sling in town! Oh, we have a fracture at the moment too. And funnily enough, a girlfriend suggested yesterday that I whip up a little red and white polka dot number for my Miss B. Which struck me like a bolt of lightning too. How didnt I think of that? Can I just say though, that the current hospital issue sling, even after a couple of washes, looks like its got mange! Not pretty at all. A nice sling, or two will be sure to help the recovery period. Hope it isn't too sore, and that fine art is filling up the plaster. Poor little one with a broken arm. Panadol is good for broken bones. Having had one here late last year on our 4.5 yo, we commiserate extensively. Another source of slings is one of those fabric scarves hiding away in the drawer that you haven't had out in ages....sounds like I know what I'm talking about huh?? Also you can get a rubber glove type thing that has a tight armhole so it covers the whole cast/arm and seals it all up tight. They can be found at some Pharmacies and possibly through whichever fracture clinic you attend. Worth the $30 or so, we had one for the beach which we borrowed from a friend, it was fabulous, waaayyyy better than the plastic bags which kept springing a leak! Oh can we have piccy of the arm and wizz bang new sling? I am surprised you were not given one at the surgery or hospital! 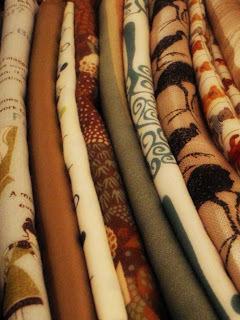 See now I would have actually ignored my stash and taken her advice and gone to the fabric store for special "sling fabric" - what an awesome excuse to buy more! Nup, I'm way worser. When the smallest required a sling she spent the entire two months swapping between two scuzzy bits of pharmacy white stuff - only cos I never did get around to making one. (Shhhh). Hope the poor wee arm is well on the way to mended...(or at least, not too stinky). I hope it's not serious! Your kiddo will have the most fanciest pants sling ever Liesl. I giggled at imagining your face during the remnant explanation! Hope the little person on the end of the broken arm is OK.
A definite light bulb moment! Poor little guy - hope he's ok - at least he'll have a cool looking sling! Awww, poor little one. How did it happen? I hope he doesn't have too much pain? Poor wee bloke, you can whip him up some special matching shorts (only need a pocket on one side). A thing called a remnant huh? Sage advice. this is so topical! I made my own sling too! hehehehehe, and a stylin' sling it will be too!